For those who have been following along, I have been detailing my experimentation with Ubuntu 14.04 32 Bit as a solution to my aging Windows XP without the expense of upgrading to Windows 7 or higher. In, Making Ubuntu 14.04 Work for Me – The Easy Stuff, I covered the easy solutions. Now it is time to address the harder problems. I had come to rely heavily on Microsoft Office 2010 version of OneNote for easy copy and paste activities and recording various efforts. I had also created a simple Contacts Access Database with more than 5000 entries. It would be a shame to have to give up on both of these resources. 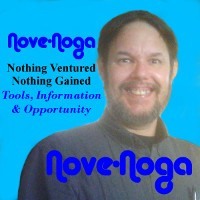 One of my primary activities is the development of my Nove-Noga.com Website. As part of the conversion to Ubuntu, I decided to explore new tools for my efforts. One unexpected problem area turned out to be making my Brother Printer work with Ubuntu. Fortunately, there are many people interested in making Ubuntu work for us. Microsoft OneNote was a key tool in my Windows Efforts. I was using OneNote as supplied my Microsoft Word 2010. I liked the simplicity of the Notebook structure and I especially liked the ability to preselect a given entry so that all I had to do was choose the entry and copy the preselected content to paste where I needed it. This function is not available in the OneNote Online. *Note: Be sure to complete the Sync process when you upload your OneNote Notebooks. * For Ubuntu alternatives to OneNote, I explored BasKet Note Pads, Zim Desktop Wiki and CherryTree. Of the three, I found CherryTree to be the most effective alternative. One of the good things about Ubuntu is the number of sharp people willing to share their experience. To make my access database for contacts accessable, I found a set of instructions. Using UCanAccess, I translated my existing database file into one accessible by LibreOffice Base. The only tricky parts of the process were making sure that I was using the proper path in the process. Afterwards it was a relatively simple task to create a new form to access the information and add records. *Note: The default format for new fields usually needs to be changed to suit your needs. I had not been using any Editor program for my HTML5 efforts. In the beginning, I did not trust the security of the free tools available. Instead, I learned to build my HTML5 pages using notepad as you would any .txt file. With the switch to Ubuntu I found the Bluefish Editor. This has already made my website updating much easier. For some reason, perhaps I didn't hold my mouth right, I had trouble getting my Brother HL-2270DW to install properly for Ubuntu 14.04. I decided to try again. This time I would follow the instructions that I found faithfully. After all, it worked for my other Ubuntu problems. To prepare for the problem, I went to System Settings – Printers, and selected and deleted my previous installation. Then I followed the Instructions to the letter. No problem. I don't know where I screwed up the first time. Maybe I followed the instructions from Brother. Whatever. It works now and that is what counts. I have encountered one persistent problem. I am not sure of the cause. From time to time, it is as if I have Scared the Ubuntu 14.04 Operating System. My screen becomes hashed and unreadable. Usually, all I need to do is hit Ctrl+Alt+Del, the three fingered goodbye, to reveal the restart/shutdown options. Then I close that and continue. Occasionally, it shuts down by itself. This is irritating but usually not fatal. I save frequently and the recover efforts usually work properly. A friend has suggested that I would have been better off with Ubuntu 12.04. For now, I will stick with Ubuntu 14.04 and hope I find a way to solve this problem. With the demise of Windows XP and the cessation of updates to Chrome for Windows XP and several other platforms, many of our computers may be headed for the scrap heap. Our options are to pay for upgrades to a newer Windows platform or finding another alternative. For me, Ubuntu has been a no-cost alternative. There have been a few teething problems. The interesting thing is that finding new ways to solve your problems can lead to results you never expected.